Sai Baba manifested the Golden Lingham during a discourse to college students at Whitefield, near Bangalore, South India. Many people have been healed by touching this photo to their bodies. An Indian medical doctor, Dr. Doraisingham, from London, England, raised a child from the dead by holding the photo against his body. Sai Baba says that wherever this photo is kept, there will be blessings, healings and miracles. 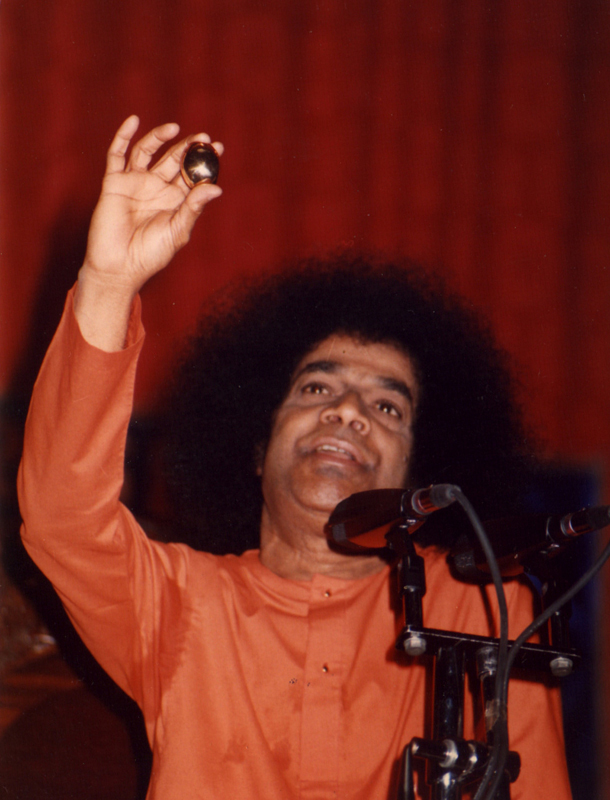 On May 5, 1991, Sathya Sai Baba materialized a golden egg that has several names and is rich with symbolism. 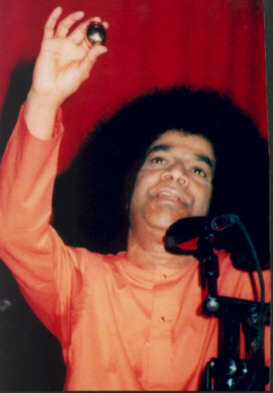 Baba said that the Hiranyagarbha Lingham (Golden heart lingham) "contains the entire universe in a microscopic form. It is a manifestation of the Trinity: Brahma, Vishnu, and Shiva (God as Creator, Sustainer and Destroyer). It is also the Atmic consciousness (Holy Spirit)--like a thread running through a pearl necklace. It is also the spiritual heart." In the Spiritual Heritage Museum in Puttaparthi there is a quote by Baba referring to the lingham (lingham in general) as the Cosmic Seed of Creation." After Sai Baba had manifested it, he said that it is a great blessing for anyone to receive this photo and that it should be kept in every home. His energy will work miracles through it. This is the first time that anyone has ever heard Baba say this about a photo. Dr. M. Doraisingham, whom I had never met, who sent the photo to me from England, sent the following story in a four and a half page letter. Baba had just materialized the Golden Lingham while standing on the auditorium stage at the Trayee Brindavan Summer Course assembly. Baba asked Professor Sampath to hold the Iingham awhile so that he could watch the student cultural program. Professor Sampath is Vice Chancellor of the Sri Sathya Sai Institute of Higher Learning, Puttaparthi, South India; he was thrilled beyond words. During the hour that Professor Sampath kept the Iingham he became warm and said that he was in a" state of divine ecstasy." After the conclusion of the cultural program, Swami played a little joke on Professor Sampath. He touched the professor's pocket as if to brush oft some dust. Later, as they were riding in the car together, Baba asked Professor Sampath for the Golden Lingham. In his excitement to return the lingham, Professor Sampath searched everywhere his shirt pocket, trouser pockets, the car seat. But he could not find it. Finally, Baba gave a joyful laugh and said that He had sent the Golden Lingham back where it had come from. Dr. Doraisingham goes on to say "Swami says that He created the Universe at His own will and pleasure with the word AUM. Here again He proves this fact by creation of this microcosmic universe, with the wave of His hands in a few seconds, by His supreme will. This is the incredible power of our supreme Lord Sai, whose glory we cannot fathom. But we are able to have a small glimpse of it by the example of this event--the Grand Miracle. All glory to our beloved Lord Sai who is our dearest divine Mother and Father." Dr. Doraisingham also said that on June 7, 1991, while walking to darshan to see Baba, he came upon a dead child beside the roadside, held by his mother. The doctor had just been given the Golden Lingham photo and held it against the child, who had just fallen out of an overcrowded van onto the road and been killed. He chanted "Om Sai Ram" many times while praying to Baba and massaged the boy's chest and abdomen. The dead child was restored to life with the energy of Sai moving through the photo and the next day, in an interview with a friend of Dr. Doraisingham, Baba confirmed the entire incident. Baba impressed the doctor to stop, to heal the child using the photo, and later said to professor Anil Kumar "The child was dead at that point in time." In January of 1994 when this author (Connie Shaw) gave a talk in Houston, Texas, USA, on the lingham photo, several people were healed on the spot simply by touching it to the afflicted area. For example, a few people who had experienced headaches that very moment were relieved of pain. One man was in pain from kidney stones; he placed the photo against his lower back in the kidney area and the sharp, stabbing pains vanished. When Sai called our family to India in January of 1995, we had the good fortune to meet with Dr. John Davis, formerly of Boulder, Colorado and Seattle, Washington. In the social interactions we had, John told of Baba's instructions in His January interview with John. Among many notable happenings Sai told John to repeat Rama, Rama, Rama nine times while rubbing John's mercury lingham in a circular fashion over the Sai lingham photo "which would produce individually-suited types (colors and textures) of vibhuti ash for each client/patient who came to John to be healed. Baba also stood on John's hands for over fifteen minutes and said "Now you have healing hands." Dr. Davis has recently been designated as the head of the Alternative Medicine Wing of the new Super-specialty Hospital in Puttaparthi, South India. He is also starting an alternative medicine school there. John Davis, a rolfer and chiropractor, executed a profound healing on me at the hospital during that same trip to India. His rolfing, however, is only for the most courageous clients as it is temporarily excruciating (emotionally and physically), yet the pain lasts only a few moments and great waves of energy can engulf the body to tone the overall system and outlook. Beside the patient examining bed there is an over-sized wall photo (perhaps six feet by six feet) of Baba holding the golden lingham (which represents the vastness that each human being, each "embodiment of Love" truly is). Each person who receives this background article will derive his own creative ways to use it for Loving help and service. Aside from placing it on one's altar or shelf, you might wish to keep a copy in your wallet, your car, your office desk, and in your briefcase or luggage. To give a framed copy to friends and loved ones with the background information is perhaps one of the most auspicious and thoughtful gifts one can give. You can take copy to an instant photo shop and have fifty or a hundred made very reasonably for distribution to Sai Center members, the ill, the elderly, the lonely, or the depressed. What an enjoyable service - to transfer the Johnny Appleseed idea (tree planting across America) to one of being a spreader of the Cosmic Seed of creation.